We pride ourselves in an installation service of boilers & heating systems that is efficient and meets the individual needs of your premises. 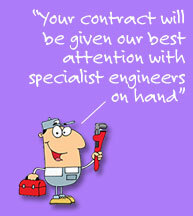 Our skilled engineers can advise you of the most economical way of securing your heating problems. Our qualified engineers are regularly updated on what current boilers are available. Most importantly they are members on The Gas Safe Register, the ONLY qualification accepted by the Health & Safety Executive, for any performance on a gas installation. An insufficient heating system will dissipate your money. Having a regular service will be cost-effective and safe for your business and employees. An insufficient gas appliance is dangerous and can omit unnecessary CO2 emissions, especially Carbon Monoxide. See the Health And Safety Executives gas awareness website for more details. Booking a regular service will enable us to remind you of when your future services are due. From the time you ring our Office; we will treat your call as priority and have an engineer to you as quickly as possible. If we do not carry a part on board our vans, we will order and treat your need as priority and get back to you as soon as possible, with efficiency and with as little or no disruption to your staff.